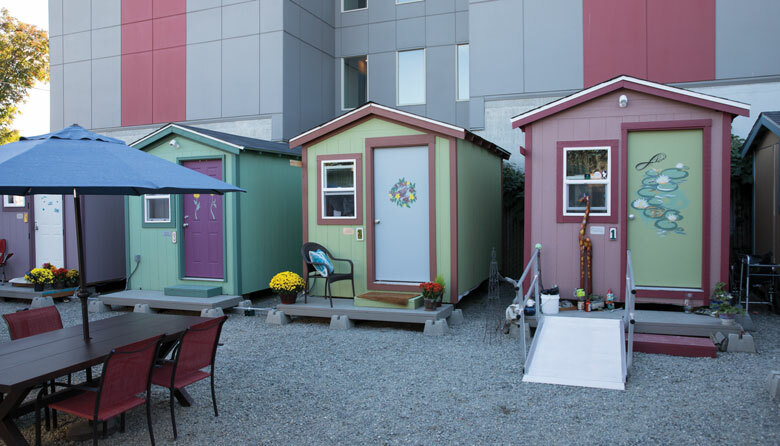 More city-sanctioned tiny-house villages spring up this year, a quick-fix response to the lack of affordable housing and overcrowded shelters. The 15-unit Whittier Heights Village becomes the first women-only community among them. Meanwhile, North Seattle’s controversial no-barrier Licton Springs tiny-house community is scheduled to close in 2019. Some 100 homeowners wait in line to help solve the homelessness crisis in a very personal way: by inviting a homeless person into their backyard. Architects, activists, and father-daughter super duo Rex Hohlbein and Jenn LaFreniere of the Facing Homeless Project develop blueprints for an off-grid, self-sustaining 125-square-foot shelter for homeowners to install on their property. Dubbed the Block Project, the program matches homeowners and home recipients through services such as Mary’s Place and The Sophia Way. In partnership with local businesses and nonprofits, Pearl Jam’s two groundbreaking “Home Shows” in August raise more than $11 million to support services for the homeless. Since 2003, the Homeless Remembrance Project has been tending a growing pile of leaves: metal sculptures called “fallen leaves” that are embedded in sidewalks across the city in remembrance of a homeless community member who died on the street. As of press time, the project has put in 33 new leaves this year, bringing the project total to 287. This year’s Seattle Design Festival features an unusual installation: a walk-in structure titled “To House,” created by the American Institute of Architects’ (AIA) Seattle Committee on Homelessness and the city’s homeless newspaper, Real Change. Encouraging viewers to “step into” the conversation about homelessness, the installation features the smiling face of Lisa Sawyer, a pro-housing advocate, writer and Seattle magazine’s unofficial Real Change vendor. “Talk to a person who is homeless, get to know them,” she says. Citing the state’s Homestead Exemption Act protecting property from forced sale, Washington’s Supreme Court rules in favor of Steven Long, who filed suit after his car—which he was using as a home—was impounded along with all of his possessions. More than 3,000 residents in similar circumstances can now park safely in designated areas (per city ordinances), without the threat of towing or excessive fees. The pace of homeless camp sweeps has nearly doubled since the beginning of this year, rising to about six per week. The city says it’s to remove encampments where illegal activity occurs or those that are deemed unsafe. Critics say it’s to clean up areas for tourism. Whatever the reason, the city continues to be divided in its efforts to improve the homeless crisis. Spiked ledges, fencing, benches with armrests that prevent anyone from laying down: This is “hostile architecture,” designed to keep the homeless from camping, sleeping or otherwise living in certain areas. The city finds itself in the hot seat for such tactics after various outlets report the conspicuous appearance of bike racks in a former homeless encampment.